Governorship Aspirant of All Progressives Congress, Chief Segun Oni, says his re-election bid is a redemption mission and urges every progressive-minded person to be partaker. The former Governor of Ekiti State is currently seeking nomination by APC to contest the 2018 governorship election in the state. 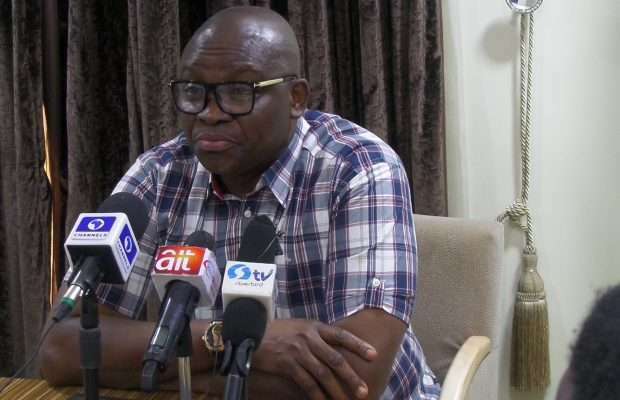 Oni, who is also the Deputy National Chairman (South) of APC, in Ado-Ekiti on Wednesday advised doubting ‘Thomases’ to be patient and be watchful. “My re-election as governor of the state is on a mission of redemption and I urge everyone who sees himself as a progressive to join the train and be a partaker. “And for those who are yet to fathom how it will manifest, I will advise that they should be patient and be watchful because this is an assignment God has perfected and which no one can undo. “Blackmail can’t undo it. Let’s work together and face the task ahead to free the state from the stranglehold of its captors. “It is still strange to me that some people in APC believe that just any aspirant would do. “The correct position is that Ekiti State is hugely populated by residents of voting age and when we employ strategic thinking and approach, our party would regain power in the state. “We have a very good opportunity this time around and we must work together to get to our Uhuru. “Enough of anonymous newsletters and pamphleteering to disparage my person. “If they are yet to come to terms with the reality, with all intents and purposes I will be the next governor of Ekiti State by God’s grace. “Today, the popular candidate wins election, most especially in this our Ekiti. “The people can now see clearly and think wisely to decide who they want as their governor. Today, the electorate votes for one with the best name, integrity and image,” he said. The former governor, however, queried attacks on his person. Oni was governor in Ekiti between May 29, 2007, and Oct. 15, 2010, under the Peoples’ Democratic Party when the Court of Appeal in Ilorin nullified his election. The court affirmed Dr Kayode Fayemi of the defunct Action Congress of Nigeria as the genuinely elected governor.